Jeremy Brenes, DIHom, Founder of Homeopathic Village, Inc., has been recognized by Marquis Who’s Who Top Health Care Providers for dedication, achievements, and leadership in homeopathy. Dr. Brenes is the founder, president, and treasurer of Homeopathic Village, which provides alternative methods of healing beyond the limits of allopathic (conventional western) medicine. He holds a BS in mathematics from the University of Oklahoma, and earned a doctorate of homeopathic medicine from the British Institute of Homeopathy in 2003. Dr. Brenes was moved to found Homeopathic Village after overcoming his own health issues through a holistic lifestyle and an understanding of the multi-disciplinary field of homeopathy. Born to Alvaro Brenes and June Brenes in Oklahoma City, Dr. Brenes initially worked in the oil and gas industry with Western Geophysical as a processing geophysicist. He has since published an incredible volume of content in books, newsletters, and online publications, notably “Homeopathic Repertory of Heavy Elements,” “Dice Roll Probability Tables,” “Homeopathic Village Electronic Newsletter,” and “Plants Remedy Index.” The Homepathic Village is accredited by the Better Business Bureau. On the Homeopathic Village website, visitors can peruse the deep history of alternative medicine, and peruse the various scientists and findings that formed the basis of homeopathic medicine. There are also numerous case studies about patients who have found remedies where conventional medicine failed. Dr. Brenes is married to Wenling Yu, and was selected for inclusion in numerous Marquis Who’s Who publications. 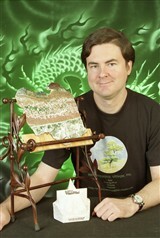 His research and various homeopathy resources are available for reading on http://homeopathicvillage.net/. Dr. Brenes also gives his time to the History Channel Club and the Folio Society, and enjoys a number of wholesome hobbies, including gardening and reading.